I think our house must be the house with the most items from eBay, car boot sales, charity shops and other bargain haunts. Our latest acquisition is just fantastic (see bed below). 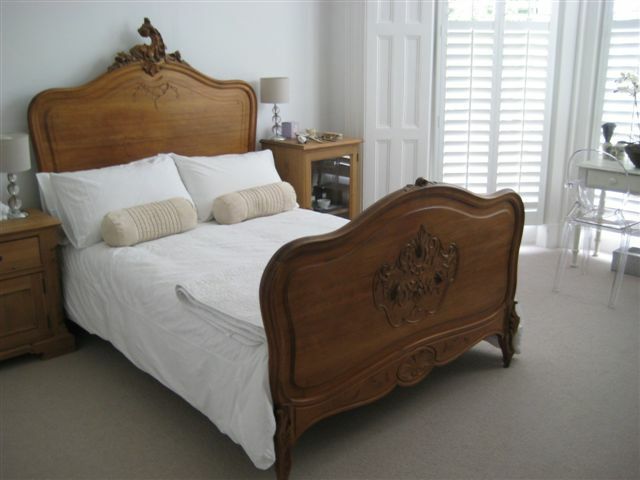 It is an antique bed from around 1900 which was delivered just this afternoon. I just love it! I think, as always, that when you’re buying on eBay, there is of course always an element of risk, but luckily the majority of sellers do it often, have a reputation to maintain, and are therefore really helpful, friendly and above board. I have been looking for a bed with a little character for ages. I wanted something that won’t be ‘fashionable’ which will date in year or two’s time, and I must say, I am thrilled with the purchase. Next thing to hunt for, will be the ‘perfect’ side tables and art. In my mind I know exactly what I want for side tables, but it think I will have to be patient to find them. Art is a little harder, because Tim and I simply don’t agree on art 90% of the time ….